Winston Churchill was so concerned about an invasion of England by the German armed forces that a network of fortifications transformed southern England into a prepared battlefield. Out of an estimated 28,000 fortifications and brick or concrete pillboxes constructed up to 1940, it is estimated only 6,000 odd remain today. These pillboxes were the most visible part of England’s defence known as the GHQ line. The French Resistance during world war II is well known organisation. What is less well known is England’s last defence was a formation of Auxiliary Units, a special ops branch of the Home Guard that would form the heart of England’s Resistance. These units needed to be set up and equipped before we were over run. 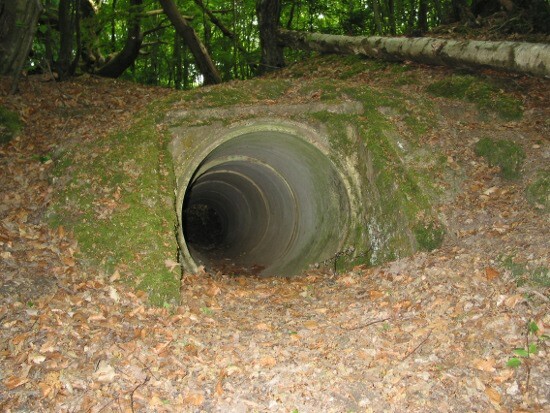 With no interest in the Royal Wedding over the bank holiday we decided to go out for a walk in 100 Acre Wood in Wivelsfield Sussex and see if we could find the remains of The Ditchling Patrol’s Operational Base. 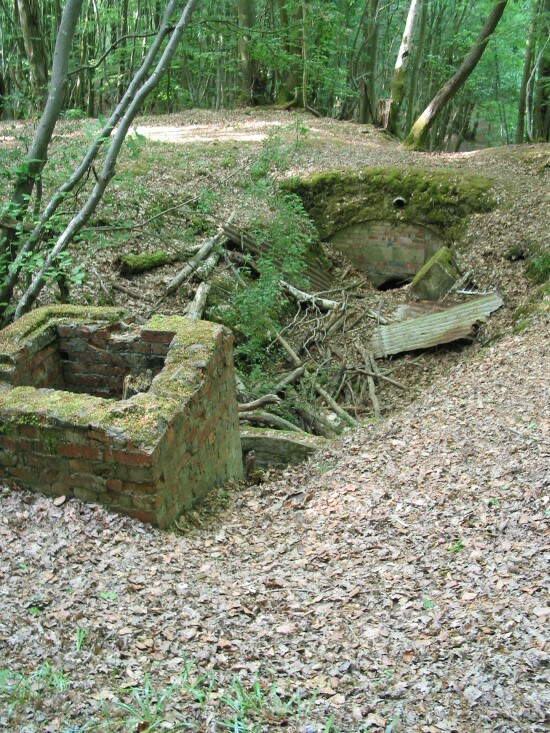 This was their hideout and operation base, where England would have operated her last gasp of fight to an invading Nazi army. Had Germany forces invaded England and been successful, this is one of a handful of places that England would have been fighting from. How the hide out looks today. In its day the brick entrance shaft would have been below the surface level hidden under a trap door. According to the Sub Brit site, link below, the trap door was counter weighted with a lock mechanisim such that trying to lift the hatch would not work. There was a hidden wire elsewhere that when pulled, caused the trap door to pop up assisted by the counter weights. Clever eh?? The exit of the escape tunnel emerges on the side of a steep hill. I’m not knowledgeable about trees, however, it struck me that there was little cover to make an escape into the woods from this point even after 70 years of growth, without being seen fairly quickly by someone stood at the entrance to the hide out. It would however have been a vantage point to mount a surprise counter attack on the entrance to the hideout. Having killed the attackers there would have been time to melt into the woods and make your escape. Its easy to be lulled into thinking the Auxiliary Units were disbanded after the threat of invasion had passed. The Auxiliary units were disbanded around 1944, however the idea wasn’t. The idea was morphed into another organisation and they remain today with many European countries now having set up their own. They are now known under the generic names of Operation Gladio or Stay behind forces. Tagged French Resistance, Invasion of England, Operation Sealion, SOE, World War II. Bookmark the permalink.